R&B favourite Trey Songz has finally premiered the much-anticipated video for ‘Na Na‘ – and he certainly doesn’t disappoint (I’m sure his “Trey’s Angels” fanbase around the world are none the less delighted). He’s really got a relentless habit of taking his top off in his videos hasn’t he, that Trey? Just what are we going to do with him? 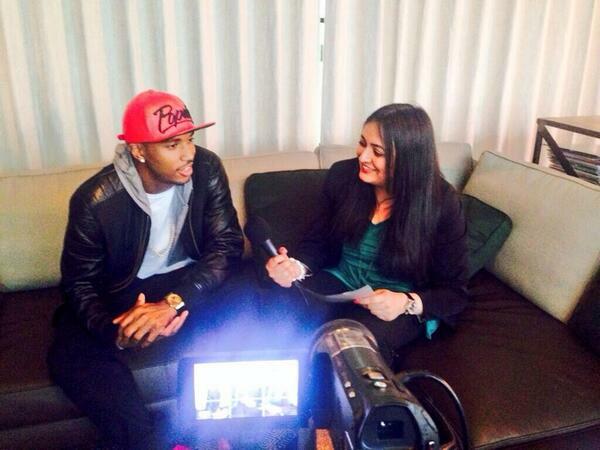 “LIVE NOW #TRIGGA #NANA” Trey said, taking to Twitter to post the official video link to his 7.2 million followers. ‘Na Na’ is the first single from Trey’s upcoming sixth studio album ‘Trigga’, which is scheduled to be released on June 30th, as Trey confirms in the beginning of the video, where the word ‘Trigga’ flashes up on screen followed by ‘Summer 2013. I can’t wait for his album to come out, if it’s anything like Chapter V, Ready or Passion, Pain and Pleasure I just know it’s going to be best friends with my iTunes repeat button. The steamy video for ‘Na Na’ begins with Trey and his girl returning from a date, where she suddenly admits she wants to get engaged, “Are you serious?” Trey laughs, with that stunning smile of his, before he’s led into the back of what looks like a jewellery shop where he eventually ends up standing in a… gym. Yeah, a secret gym at the back of the store, a black-and-white one at that. As the video commences, the temperature gets hotter as Trey and his on-screen girlfriend work out together, jumping ropes, lifting weights, throwing punches and all sorts, before he’s finally forced to take his top off as usual (it’s generally the standard of his videos, but I’m not complaining.) In all honesty however, I don’t quite get the entire point of this video and I feel as if it was slightly rushed, I was half expecting the shop to lead to a club, but I guess it’s definitely something different. I much prefer his videos that have a concrete storyline, such as the accompanying visuals for ‘Heart Attack‘ and ‘Simply Amazing‘. ‘Na Na’ follows up Trey’s previous video for Mariah Carey’s alluring new single, ‘You’re Mine (Eternal)‘, a track which he features on. ‘Na Na‘ is set to be released on March 16th in the UK and is available to pre-order on iTunes now. In the meantime, check out the official video below!